What is Your Favorite NRC Reg Guide? Commissioner Apostolakis congratulates contest winner Adam Glazer. It was an unexpected pronouncement when, during the annual All Employees Meeting at the NRC, Commissioner George Apostolakis admitted Regulatory Guide 1.174 – otherwise known as “An Approach for Using Probabilistic Risk Assessment in Risk-Informed Decisions on Plant Specific Changes to the Licensing Basis” — was his favorite. It was not a surprising admission, though, since the Commissioner had been on the Advisory Committee on Reactor Safeguards and active in the development of the guide. But it got us thinking – Reg guides are important documents that offer guidance on ways agency regulations can be implemented. Does anyone else have a favorite Regulatory Guide? So we asked employees to submit their favorites. The winner would get $50 donated to his or her favorite Combined Federal Campaign charity. 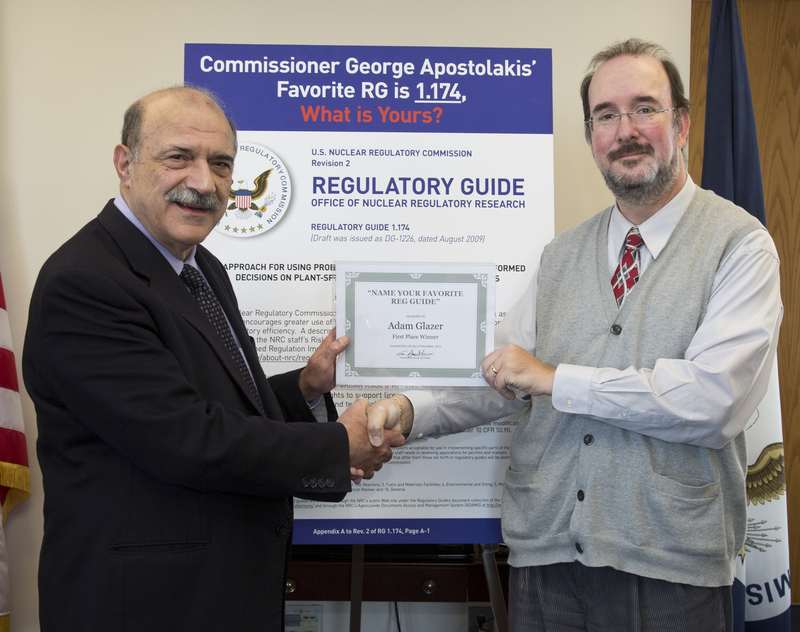 Adam Glazer, an IT specialist, won the contest with his tongue-in-cheek tribute to Regulatory Guide 10.8 – otherwise known as the “Guide for the Preparation of Applications for Medical Use Programs.” His tribute claimed that particular guide had been involved in historic events ranging from saving the troops at Valley Forge in 1775 to helping mediate peace during the Russo-Japanese War of 1904-1905. In a more serious vein, Julio Lara, of Region III, declared Regulatory Guide 1.26 “Quality Group Classifications and Standards for Water-, Steam-, and Radioactive Waste-Containing Components of Nuclear Power Plants” as his favorite. That guide had tripped him up during his Inspector Qualification Oral Board in 1989, and he had to study it and twice demonstrate his knowledge of it before being certified as an inspector. Christine Lipa, also of Region III, also had a personal reason for her favorite regulatory guide. She cited Regulatory Guide 1.97, “Criteria for Accident Monitoring Instrumentation for Nuclear Power Plants.” This document provided guidance to the nuclear power industry as it implemented new requirements after Three Mile Island accident. “When I was a new inspector in Region III in 1990, this was the first set of inspections I was involved in,” she wrote. Mark King, of the Office of Nuclear Reactor Regulation, cited Regulatory Guide 1.33 “Quality Assurance Program Requirements (Operation)” as ‘the most awesome.” He said it’s the foundation for licensees having proper procedures for operating the plant and handling emergencies, and is the most frequently cited Reg Guide by inspectors when writing up finding and violations. So, the question is: Do you have a favorite Regulatory Guide? We noted the interesting entries with links to the guides. Before I even read past the title, I knew my favorite is Safety Guide 1 (a.k.a. RG 1.1). Short, sweet, and it embodies the original intent of defense in depth: keep the RCS pressure boundary and containment analyses separate, don’t rely on one to protect the other. My favourite is RG 1.70, although it now has been replaced by RG 1.206. RG 1.70 set the standard for format and content of a Safety Analysis Report, what could be more important than that? Still being used and referenced. I think the people behind RG 1.70 did an immense job and RG 1.70 have maybe meant more to reactor safety than any other RG. Who even knew we had “The Best Regulation Guide” category?!! !